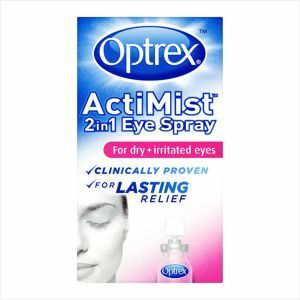 Optrex ActiMist Eye Spray relieves, refreshes and revives. Clinically proven eye spray for immediate relief from the symptoms of dry eyes, such as irritated eyes. Optrex ActiMist Eye Spray works by stabilising the lipid layer, the part of the eye's natural tear film which reduces tear evaporation. The spray gently applies liposome particles onto your closed eyelid. The particles refresh and improve hydration of the eye. When using for the first time, push down on the nozzle 3 - 4 times.